February 2020: Wetland Workshop on February 11. ND Chapter of the Wildlife Society annual meeting February 12-14. You are invited to attend the Professional Women in Natural Resources Social which will be held on February 14 from 4:00 pm to 6:00 pm. There will be a silent auction, sharing of career and conservation information, and refreshments served. Cost for professionals is $10 and students are free. The social will be held at the Baymont Inn and Suites in Mandan, ND during the Chapter’s annual meeting. Hope to see you there! The ND Chapter of the Wildlife Society’s Annual Meeting will be February 13-15, 2019 at the Baymont Inn and Suites in Mandan. Registration for the event is now open. Register early – the registration fee will increase by $15 after February 8th. Registration fees include meals for the Wednesday evening Fundraising Event and the Thursday Evening Awards Banquet. If you would like to attend the Student/Professional Luncheon be sure to include that in your registration as it is not part of the registration fee. DON’T FORGET – your registration does not include your membership dues. You can also renew and pay your membership dues online. Take a sneak peak at the 2019 Tentative Agenda. Thank you so much for your continued support of the Chapter, we look forward to seeing you in February. The Fundraising Committee would like to thank all the members that have supported the annual auction in the past. It is not too early to start thinking about the upcoming annual auction and donation of auction items. The fundraiser provides the financial foundation for the activities of the Chapter for the coming year. So help support the Chapter by putting your craft skills to work, dust off those prints/books/antiques that are in your closet or under your bed and bring them to the annual meeting. Handmade items are always welcome! As always, the committee is interested in your ideas and suggestions on how to improve this event and keep it enjoyable and exciting for all. Contact: Alegra Powers if you have items to donate: argela@yahoo.com. The Chapter will once again hold a GUN RAFFLE. Be on the lookout for your tickets and start thinking of who might want to buy a few. If you did not receive any and would like to participate contact Alegra Powers at argela@yahoo.com. There will be a Women in Conservation Social Event at NDSU (Memorial Union Badlands Room) on November 14, 2018 from 6-8pm. A perfect opportunity for students to network with professionals in a field they are interested in as a future career. See flyer for additional details and please help spread the word! Please help spread the word! 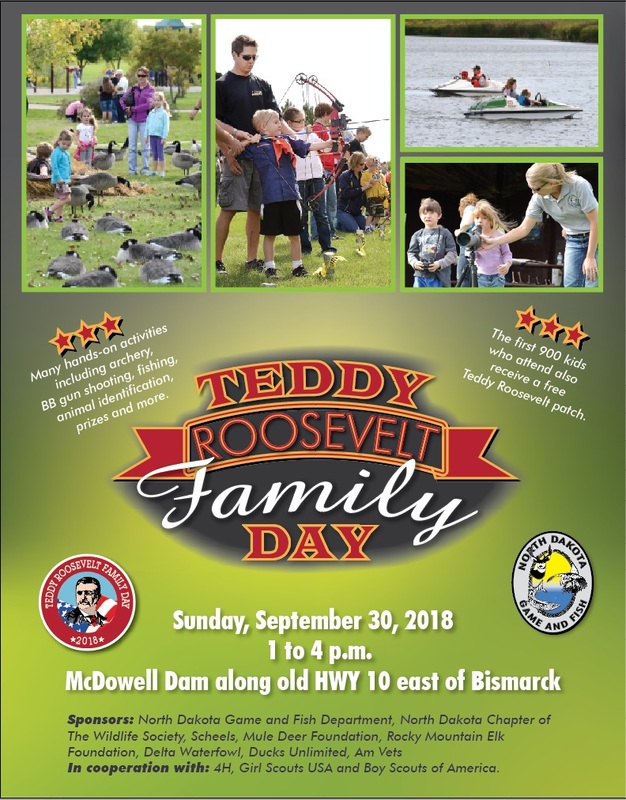 Teddy Roosevelt Family Day will be held on Sunday, September 30 from 1:00pm – 4:00pm. Join in the fun at McDowell Dam, located along Old Highway 10 east of Bismarck. World Wildlife Fund (WWF) releases “Plowprint Report” – The purpose of the Plowprint analysis is to identify remaining intact habitat across the Great Plains. This is done by tracking cumulative loss of grassland to cropland over time. WWF is estimating cumulative loss of grasslands because the conversion of intact grasslands represents a significant ecological loss that cannot easily be recovered. WWF is dedicated to eliminating grassland loss in the Northern Great Plains by 2030 to ensure a vibrant future for the human and wildlife communities across the region. As a continuation of this winters Pollinator Workshop the North Dakota Chapter of The Wildlife Society would like to invite you to participate in the 2018 Summer Pollinator Tour. The days are run independently of each other. For more information see the flyer. Thank you to those folks who supported this year’s fundraising efforts, both through donations and participation! Congratulations to the winners of our Gun Raffle: Terry Schaffer, Randy Renner, and Alfred “Skip” Stonesifer.